When 22-year-old Divya, who belongs to the vanniyar community, decided to elope and marry a dailt youth, all hell broke loose. 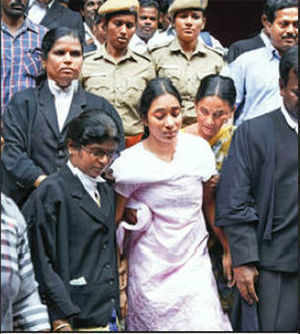 CHENNAI: Divya Nagarajan could barely stand in the Madras high court premises on Thursday. The pressures of a seventh-month ordeal that included a daring elopement, an inter-caste marriage and caste violence, with strong political overtones that spread across Dharmapuri district, sat heavily on her young shoulders. When 22-year-old Divya, who belongs to the vanniyar community, decided to elope and marry a dailt youth, all hell broke loose. Her father Nagarajan committed suicide, promptingvanniyar community members to go on the rampage in the dalit habitation in Natham colony in Dharmapuri district in November last year. “My husband and I are under huge pressure. I have decided to sacrifice my love, my marriage, for the sake of a society that is caste-obsessed, and for the sake of my mother,” Divya told TOI. Divya said she was under tremendous pressure to leave her husband and that she was in a disturbed state of mind. Her mother and relatives accompanied the young woman, who appeared too weak to even stand on her own, in the court premises. Her marriage to dalit youth Elavarasan in October last year against the wishes of her family precipitated a deep vanniyar-dalit rift not seen in the region for more than a decade. Under pressure from village leaders to advice his daughter to return to the family, Nagaragan committed suicide, triggering violence that spread rapidly in the region. “My father’s death was unexpected. I have been feeling guilty about his suicide, the violence that followed and the houses of dalit families that were burnt down. I am unable to sleep or eat properly due to the trauma,” Divya said, breaking down. “Now, whenever I think about it, I shiver with fear. I can’t understand why caste plays such a role in our society?” she said. Justifying her decision to suddenly leave her husband and to return to her mother, Divya said, “I have certain responsibilities towards my family. At the same time I am also grateful to Elavarasan, who took good care of me despite the turmoil around us,” she said, adding that she was forced to remove her mangalsutra soon after she reached her mother’s house in Sellankottai in the district. Divya said she was not kidnapped or forcibly taken away from her husband. “I have been talking to my mother in recent months over phone. I can understand her trauma. Elavarasan and I have also been under huge social pressure,” she said. On Tuesday, when her mother came to Dharmapuri town for medical treatment, Divya decided to meet her and accompany her back home. “It was a tough decision for me,” she Divya, trying to hold back tears.